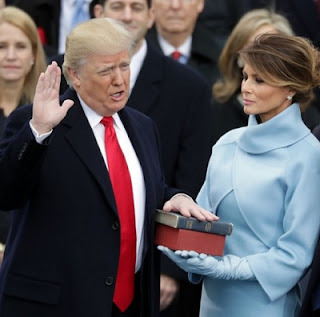 On Friday, billionaire businessman, Donald J. Trump, was sworn in as the 45th president of the United States of America. After he took oath of office, he read out his inaugural speech, in which he stressed that Americans have taken back the reins of power. Trump thanked his predecessor, Barack Obama and his wife Michelle, for their cooperation throughout the transition period. “Chief Justice Roberts, President Carter, President Clinton, President Bush, President Obama, fellow Americans and people of the world, thank you. At the center of this movement is a crucial conviction that a nation exists to serve its citizens. Americans want great schools for their children, safe neighbourhoods for their families and good jobs for themselves. For many decades we’ve enriched foreign industry at the expense of American industry, subsidised the armies of other countries while allowing for the very sad depletion of our military. We will get our people off of welfare and back to work, rebuilding our country with American hands and American labour. Together we will make America great again.